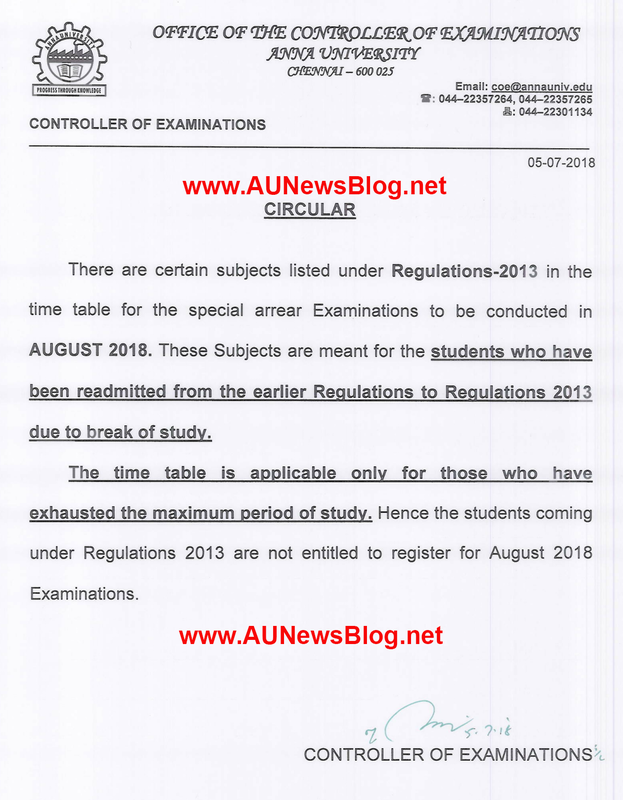 Anna University published Clarification Notification for Special Exams August 2018. Because Most of 2018 Passed out and Regulation 2013 students ask this question can I write August 2018 Exam? again and again. So, Anna University published official notification regarding it. Note: Special Exams August 2018 only for those who have exhausted the maximum period of study. Useful Links: Anna University Special Exam August 2018 Time Table & Special Exam August 2018 apply procedure. Sir 2017 passed out apply PPanlama? 2008 reg but 2015 passed and exhausted my max period of study on April/may exam this year.Can I write the exam??? 2008 reg and 2015 passout .registration preview eduthutan 5300 amount athula kaatuthu and yetha bank la DD edukanum sir?icici, axis, intha maathiri bank la DD edukalaama? yes yedukalam. Sorry. Last Date of Registration over right now. sir im 2015 passed out and my regulation 2008 .can i write this special exam?how much i have to take dd?and which bank? Sorry. Last Date of Registration over right now. any way to apply for AUG special exam now ?? Any Fine ?? Sorry Only one chance left. Working good. Already registration over and Hall tickets issued. Already applied for special exam. where will hall ticket come ? registered center or own college ? Collect your hall ticket from your registered centre. Already Hall ticket sends to all the centre. I'm 2015 passed out student, I have exhausted my last attempt at April 2018. Now I'm writing special exam - August 2018. DO I have one more attempt by February 2018 since they have mentioned to give 2 attempts for the students who have exhausted their attempts. i missed the aug 2018 exams is there any orther chance sir............???? Sir, Any tentative date for August 2018 exam results? Paper correction over. So, Result expected on any time. sir Any Tentative date ? On feb exam, result came after 35 days. This time sep 7 exams over, so oct 1st week shall we expect ? Sir, Feb results came after 35 days from the exam over date. So sep 7 exam over Shall we expect the results by oct 1st Week ? Pls guide me hownto check the aug2018 results . Sir aug special case exam result published??? When will update august special cases exam results date ??????????????????? say any Tentative dates for aug special exam results. or say when will results publish. Result server ready. Result expected on anytime. Only waiting for COE order. results got. Where can we get the certificates ? Sir 2008 regulation plz give me one more chance if u not i can suite ..